©Bert Gildart: This past week several organizations selected two of my images for various uses. 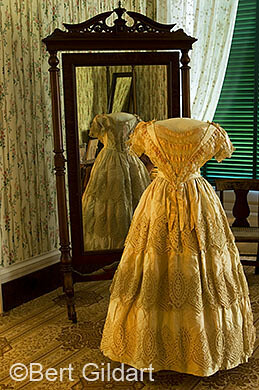 Image one was selected by Natchez National Historical Park, specifically for the Melrose Antebellum home. The image will be placed on an exhibit panel and at the Melrose Visitor Center for as long as the dress is displayed at the mansion. As well the Natchez Pilgrimage Garden Club is using this image for their Antiques Forum Brochure, hoping to increase attendants. The image was made last month while touring the Natchez Trace. At the time we were photographing everything that pertains to the Natchez Trace Parkway, hoping, in a year or so, to revamp our book about this famous parkway with new photographs. The other image recently used is one of Sarah James. Sarah is a friend of ours who lives in Arctic Village, a village located immediately adjacent to the Arctic National Wildlife Refuge. For the past 25 years Sarah has spread the word about the environment and the Arctic Refuge in particular throughout the world. This month Sarah will relate some of her experiences to several organizations and one of them, a California based conservation organization, needed an image of her. Interestingly, Arctic Village is also hosting a gathering May 30 intended to send a world-wide message. This is different from the one required by the California organization. This gathering will be held in Arctic Village, and those attending will gather in the village and create a pattern that will spell out a message of hope for the Arctic Refuge. The pattern will be photographed from the air and then be shown in Bonn, Germany, where global leaders will convene this June. Janie and I have both received personal invitations to attend the Arctic Village gathering, and if we weren’t already committed to towing our Airstream to Alaska in July, we would fly to this remote setting. But as the old saying goes, one can only do so much. The Arctic National Wildlife Refuge has been one of my passions, and over the past 18 years Janie and I have boated and hiked the refuge-and have visited most of the dozen-plus Gwich’in Indian villages dotting the tundra in both Canada and Alaska. The Gwich’in live further north than any other Indian group (Eskimos live further north). Images from our various visits have been displayed by the Wilderness Society in the halls of Congress. As well, my stories about the refuge have appeared in about half a dozen different publications. Time/Life used my images to illustrate a chapter in their book, Winds of Renewal. 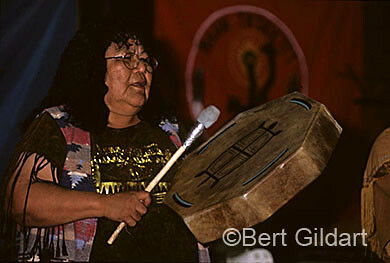 Sarah James disciple for Arctic Refuge and environment in general. Obviously, Janie and I love the refuge. Many lambaste the area saying (as did George Bush) that it is a wasteland. If you have never been there you may feel the same, but I’ll wager that if you actually visit the area, you’ll understand why Sarah James (not S. Palin!) has fought so hard to help her people call attention to what many biologists say is the world’s last self-regulating ecosystem. This entry was posted on Monday, May 18th, 2009 at 8:09 am and is filed under Books & Stories, Montana Photography, National Lands, Photography, View Point. You can follow any responses to this entry through the RSS 2.0 feed. You can leave a response, or trackback from your own site.